Have you ever been around someone and felt that they didn't like you? It's not a nice feeling. I thought of that feeling a few days ago when I read Luke 15:1,2 which says, "Tax collectors and other notorious sinners often came to listen to Jesus teach. This made the Pharisees and teachers of religious law complain that he was associating with such sinful people—even eating with them!" Can you feel the contempt the Pharisees and teachers of religious law felt towards the 'tax collectors and other notorious sinners'? Their horror at the thought of sharing a meal with such people is obvious and you can almost see them recoil. You can be sure there were sneers on their faces whenever they talked about these sinners. Now imagine you are one of those tax collectors or that you've done something to make them lump you in with the notorious sinner group. I doubt the Pharisees and teachers of religious law bothered to hide their contempt and disrespect, in fact, I have the feeling that the Pharisees were quite open about their feelings, so the sinners knew what they thought of them. If you were one of those being so judged, how would you feel? If it were me, I wouldn't feel at all inclined to be around those Pharisees and teachers. I wouldn't want to listen to what they had to say or to do what they said to do. That's pretty sad when you consider that the Pharisees and teachers were the religious leaders of the day. They were the ones who were supposed to be helping people come closer to God. I don't think they were very good at that job. Jesus, on the other hand, attracted such people. Why? Because there was no contempt in His voice when he spoke about them or when He spoke to them. There were no sneers on His face and He didn't pull back at the thought of being near them. In fact, He willingly touched those that others wouldn't dream of touching, as shown when He touched a leper to heal him. It was because of His obvious respect for them that the people often came to listen to Him teach. They were drawn to this man who could talk about the holiness of God while at the same time showing love and compassion to those who lived lives full of mistakes and failures. Who are we more like? 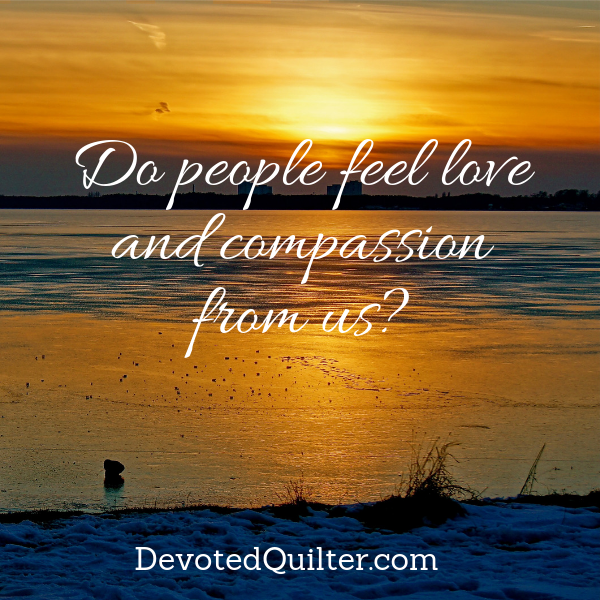 Do people feel love, compassion and acceptance when they're around us? Or do they feel disrespect, contempt and loathing? If we want to draw others closer to God, we have to first make it so they want to draw close enough to us to listen as we talk about Him. Amen!! Now if we could all get along, what an awesome world this would be.